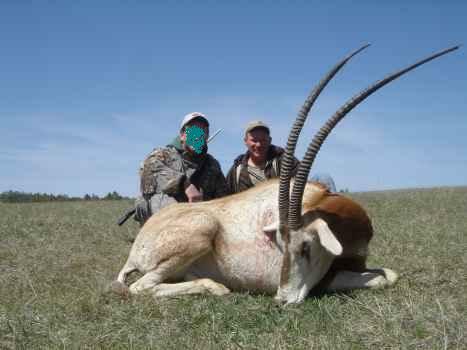 We have some beautiful animals as you can see, many of our clients are repeat hunters or have come because of the quality of the animals and the hospitality of the host. 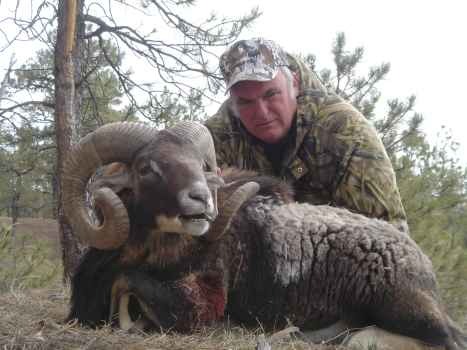 I strive to bring a great outdoor experience for you and your family and friends. The greatest reservation a hunter has regarding a game ranch is the “fair chase” concept. Is it sporting to hunt game on a fenced ranch? Most of our animals have lived their entire lives on the ranch and know its boundaries. They have learned to stay away from the fence and hide in the canyons and heavy tree cover. We have animals we haven’t seen in months. The biologists say that a whitetail will die within one mile of where it is born. It is fenced by that very nature. No one would doubt, however, that the hunt for a whitetail is fair chase. The velvet is usually rubbed off by the 23rd of August. 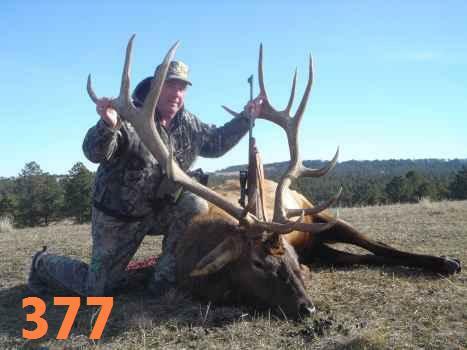 The rut starts mid-Sept. An early hunt assures the hunter of a perfect rack with less chance of a broken point, and the thrill of a bugling bull elk. 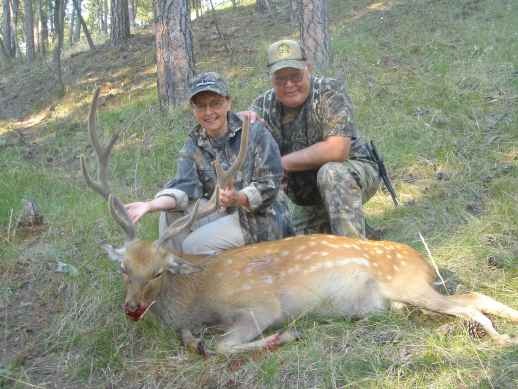 Hunting area consists of pine covered hills and canyons with lots of cover. No state license or permit is required. Food and lodging will be provided for three day hunt. 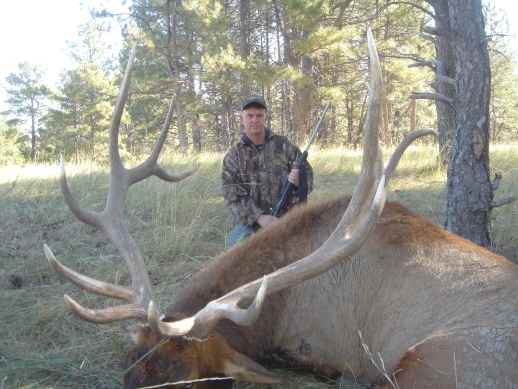 We will haul elk bull from hunting area to custom packing company or I have a walk-in cooler here at the ranch and you may cut your own meat or bone it out into coolers. 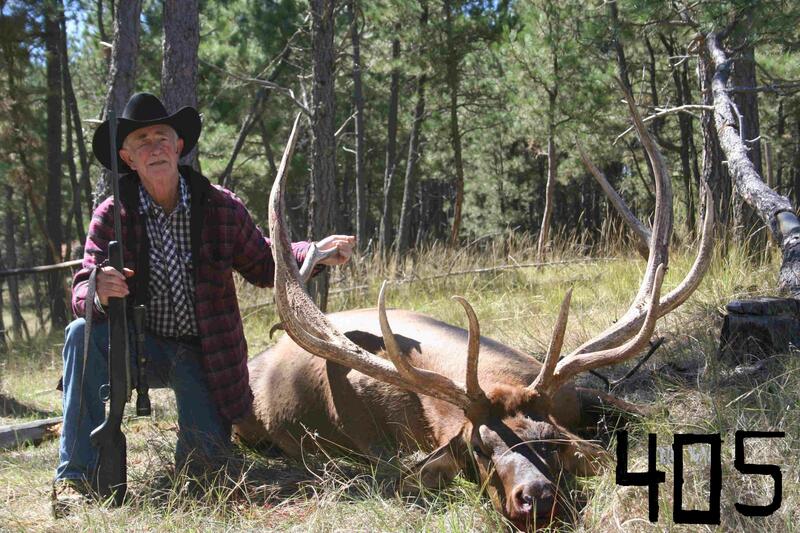 A deposit of $1000 is required to hold an elk bull , with the balance due day of hunt or before (money order, cert. check, visa/mastercard or cash). Any animal the hunter injures, wounds or kills accidentally is his at not less than the current value. Our guided hunt with weapons of your choice-- archery, crossbow, black powder, 50cal or higher, handgun or high power rifle 24 cal or larger. One party of hunters at a time, scheduled as much as possible for hunter's convenience from Aug 25 thru January 15 for antlered game. 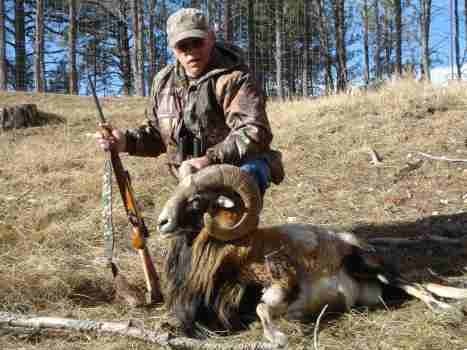 Year around hunts for rams and exotics. 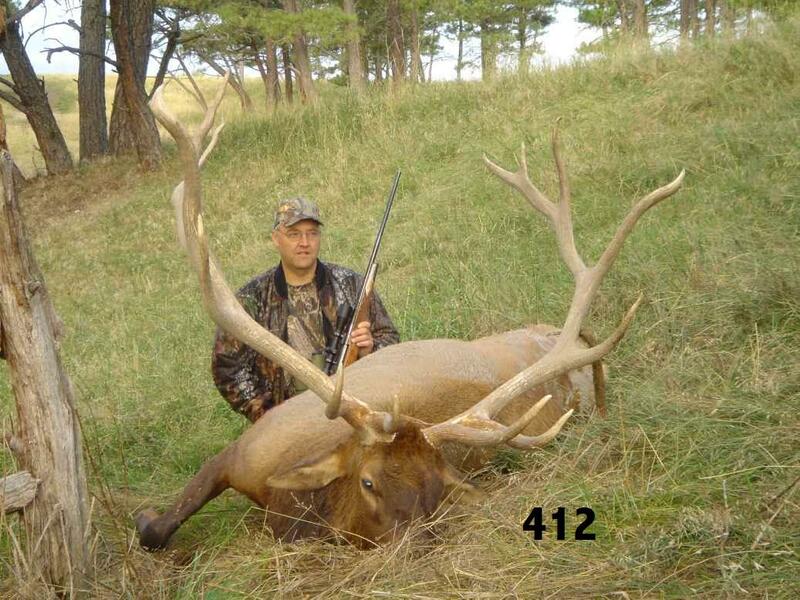 Choice of elk and dates for hunting will be in the order deposits are received. Hunter will hunt on foot, from our Polaris Ranger, or from ground blinds. Handicapped hunts are also available, we have several good locations for ground blinds (can be heated) from which a good shot could be taken. 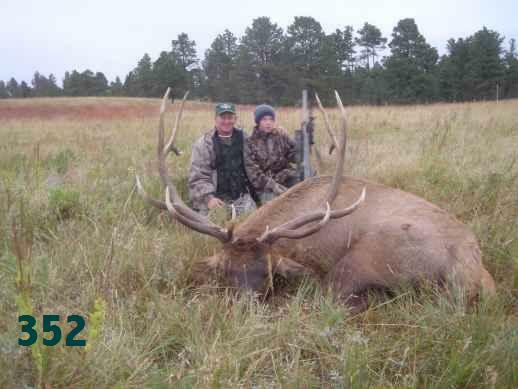 We will pick you up from Chadron Airport and provide transportation during hunt. Gratuity left to hunter's discretion. We accept Visa and Mastercard. Rules of Safety must be followed!! 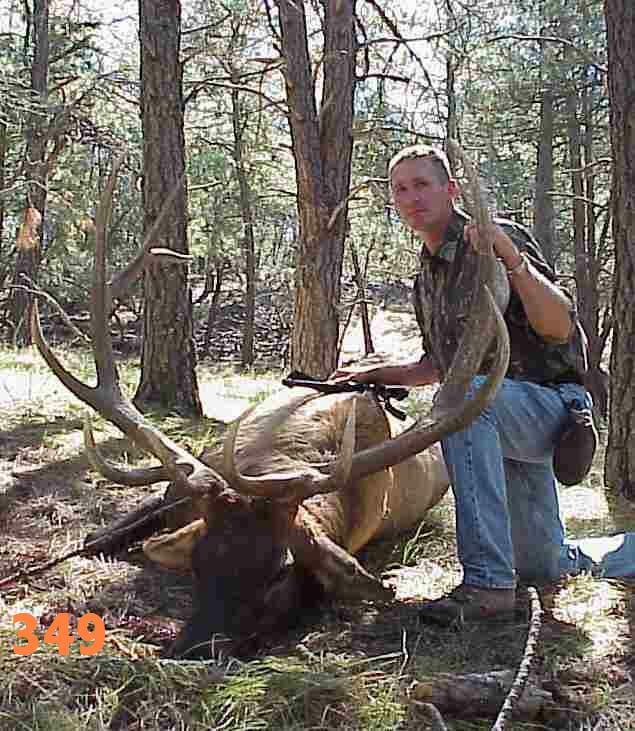 Hunter assumes all risks and will be asked to sign a release of liability before the hunt. No alcohol or illegal drugs before or during the hunt, a beer after at night is fine. We have a fridge in the cabin for this. If hunter cannot make the hunt he may find a replacement or sacrifice the deposit. 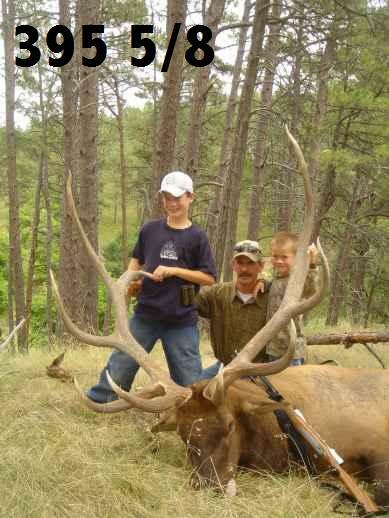 If, due to circumstances beyond owner's control they cannot provide elk, deposit will be refunded. Other Exotics available from time to time, let me know what you are looking for and I will try to get it here for you, all hunts include guide, cabin stay and meals. 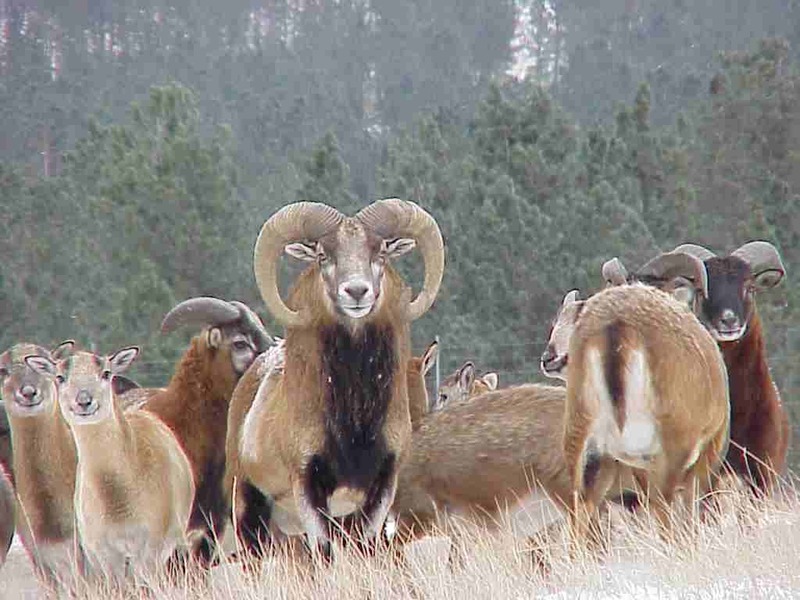 Reserve you hunts early to be assured a good hunt date, please call me at 308 432 4314 to book a hunt, evenings work best.